I Bet You Will Open Every Oreo Cookie You Eat After Seeing This. There are different ways to eat an Oreo cookie, we all know this. Some people pull them out of the package and shove the whole cookie in their mouth, others like to twist off the cookie and lick off the sweet creamy filling. I know this Oreo cookie fan was glad he enjoys the latter of the two. 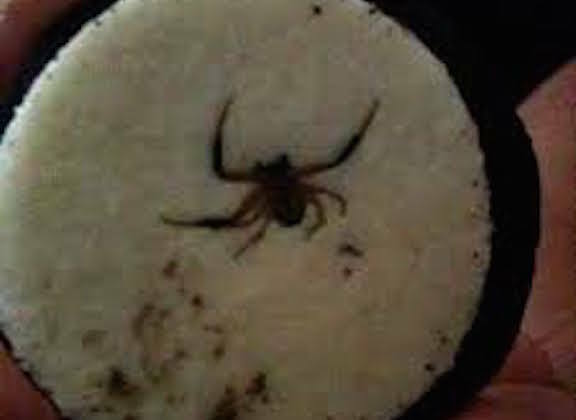 The man who took this photo found a gruesome discovery when he chose to twist off one side of his Oreo cookie. To his surprise, he found a spider which had been smashed into the creamy filling during the production process of making his Oreo cookies. Can you imagine the horror if he would’ve only bit half? YUCK! The food manufactured across the world is done in such great quantities, so quickly, that who knows what you will find in the packaging. Even the FDA has thrown their hands up in the air with this. The FDA has set allowable limits for bugs in our manufactured food. Anyway, I don’t remember the FDA allowing one spider per Oreo cookie in a 35 count package. However, he managed to work his way right in there. I bet you will open every Oreo cookie you eat from now on. Let your friends know to make sure they do too!